John Russell (George C. Scott) just had the worst day of his life. While on a winter vacation in upstate New York, he watched his wife and child get run down in the street by an out of control dump truck. A few months go by, and John, a composer of classical music, decides it is time to begin his life again, and takes a job teaching at his alma mater. The new job is across the country in Seattle, and John needs to find a new place to live. At the suggestion of a friend, John locates a house through the local historical society. It’s quite the place. Victorian, high ceilings — it even has a music room. Any house or apartment with a music room resides firmly in the 1%. The house had been unoccupied ever since it was willed to the historical society, and for good reason. The place is haunted. In fact, John would never have been able to secure a lease were it not for Claire (Trish Van Devere), the member of the society that showed John the house. She’s relatively new to her job, and thus didn’t know about the issues with the house. Also, she’s smitten with the gruff old composer with the surprisingly soft smile and history of personal tragedy. Most of the ghost movies I’ve seen recently have been made within the twenty-first century. Without knowing or trying they’ve all slipped into following the same conventions, adapted and polished from much older films. The disturbances start small, ratchet up at a steady pace, usually leading to a denouement where a member of a family has to be saved from a malicious spirit. 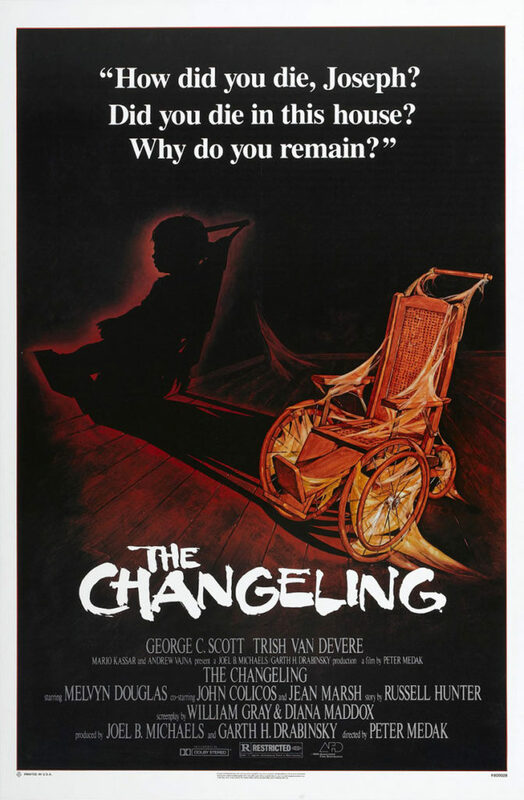 The Changeling is more than thirty years old, however, and was made at a time when the creepy haunted house, as far as I can tell, fell out of favor in horror cinema. It does follow some conventions, but while it’s easy to recognize the cinematic roots of the ghostly goings on, it lacks the rote presentation of today’s ghost films. Instead of formula, there’s story. How refreshing. At times the film threatens to slow down to a crawl, but it never does. Much time in the film is spent with Scott as the only person on screen. He being a solitary and introspective figure, the demands on director Peter Medak in getting these scenes right were enormous. They were central to the development of both John Russell and the ghost as characters, and, at first glance, all Medak had to work with was Scott’s mostly unflappable countenance. The man does not do fright. As an actor, Scott had much emotional range, something unexpected in so tough-looking an actor, but looking scared seemed to be beyond him. Normally that would be quite the handicap in a ghost film, but this seeming lack of reaction can be attributed to shock and/or emotional paralysis when the viewer sees how badly the death of his wife and daughter have affected John Russell. In short, when he was not running around in a film being bombastic, Scott revealed a tremendous amount of subtlety and depth in his performances, this one included. As the film goes on, the reasons for the haunting become clear, and the film turns out to be one of those stories where the restless spirit needs some sort of closure or revenge in order to move on. The vehicle for justice is, of course, John Russell. The resolution to the story is satisfying, if a bit over the top. By that, I mean that by the end, the ghost shows such power that I have to wonder why it needed any help from John in the first place. With that in mind, the film then becomes solely a vehicle to tell John’s story. Which is fine. Without Scott, I doubt this creepy horror film would have had legs. The Changeling is a good film for not just horror fans, but film lovers in general to seek out.